Open Web Application Security Project (OWASP) Top 10 - OWASP Top 10 provides a list of the 10 most critical web application security risks. Common Weakness Enumeration (CWE) Top 25 – CWE/SANS Top 25 Most Dangerous Software Errors is a list of the most widespread and critical errors that can lead to serious vulnerabilities in software. Payment Card Industry Data Security Standard (PCI DSS) - PCI DSS provides an actionable framework for developing a robust payment card data security process. For more details on each vulnerability, you can check the OWASP website. Pre-built rule in CAST AIP – check CAST AIP OWASP Coverage - Detailed Description for list of rules and more details. 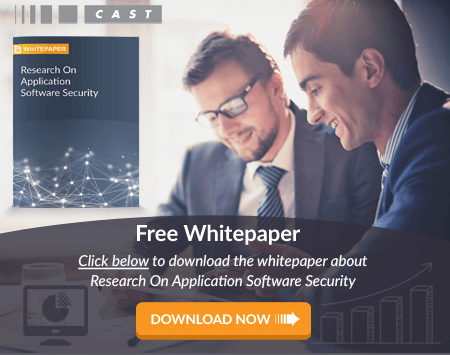 CAST supports the application/security architect by providing information about application structure, allowing the definition of custom rules using architecture checker, and the tracking and control of these rules in subsequent application development. Sensitive cryptography routines should be reviewed by a domain expert at the application-architecture level to ensure best practices are followed. CAST supports with pre build rules and with application/security architect by providing information about application structure, allowing the definition of custom rules using architecture checker, and the tracking and control of these rules in subsequent application development. Application security policies should be reviewed by a domain expert at the application-architecture level to ensure best practices are followed. Cast provides to create custom rules using SDK, CAST supports the application/security architect by providing information about application structure, allowing the definition of custom rules using architecture checker, and the tracking and control of these rules in subsequent application development. Components, such as libraries, frameworks, and other software modules, almost always run with full privileges. If a vulnerable component is exploited, such an attack can facilitate serious data loss or server takeover. Applications using components with known vulnerabilities may undermine application defences and enable a range of possible attacks and impacts. A complete inventory of the third parties (libraries, frameworks and tools) used by a project should be in place. Versions should be kept up-to-date, and current versions should be monitored for security weaknesses announcements. These vulnerabilities are not possible to find using static analysis. CAST has integrations with vendors in the SCA space who track known vulnerabilities, to display them alongside CAST AIP findings. These vulnerabilities are not possible to find using static analysis. CAST Consultant during the assessment would provide the feedback and will display them alongside CAST AIP findings. Pre-built rule in CAST AIP – check CAST AIP OWASP Coverage – Detailed Description for list of rules and more details. AIP is currently able to check that access control systems are in place for some presentation frameworks, such as Struts. All the categories, rules, and related description are referenced from CWE/SANS and CWE/SANS Top 25 Most Dangerous Software Errors. Ensure that application is free of cross-site scripting issues (CWE-79), because most CSRF defences can be bypassed using attacker-controlled script. When the set of acceptable objects, such as filenames or URLs, is limited or known, create a mapping from a set of fixed input values (such as numericIDs) to the actual filenames or URLs, and reject all other inputs. This is handled by checking every internet library for vulnerability and maintaining a whitelist. Normally we can check the HTML code and parse the URL to verify the domain. Perform check on any numeric input by ensuring that it is within the expected range. Enforce that the input meets both the minimum and maximum requirements for the expected range. avoid implementing custom authentication routines and consider using authentication capabilities as provided by the surrounding framework, operating system, or environment. Users should not be able to access any unauthorized functionality or information by simply requesting direct access to that page. Periodically ensure that you aren't using obsolete cryptography. Avoid using old encryption techniques using MD4, MD5, SHA1, DES, and other algorithms that were once regarded as strong. Checking for privileges being appropriately implemented based on the scenario/use case. Perform extensive input validation and canonicalization to minimize the chances of introducing a separate vulnerability. This will be addressed by creating a blacklist of functions considered risky or broken (Handle via maintaining blacklist of well known and crypto algorithms) and applying custom architectural rules to check for the use of appropriate functions. Checking for programming best practices. Best practice, always use initialises that contain salt for Hash. Instead of calling Hashlib with just one parameter use additional parameters for salt. The software does not check the return value from a method or function, which can prevent it from detecting unexpected states and conditions. Checking the return value of the function will typically be sufficient, however beware of race conditions (CWE-362) in a concurrent environment. When converting from one data type to another, such as long to integer, data can be omitted or translated in a way that produces unexpected values. Avoid making conversion between numeric types. Always check for the allowed ranges. Improper path traversal - Remove instances where a user input is ultimately used in a file path creation statement, without any sanitization (based on a list of vetted sanitization functions, methods, procedures, stored procedures, sub-routines, etc.) of the user input value between the user input and the statement. OS command injection - Remove instances where a user input is ultimately used to execute an OS command, without any sanitization (based on a list of vetted sanitization functions, methods, procedures, stored procedures, sub-routines, etc.) of the user input value between the user input and the statement. Pre-built rules in CAST AIP – check CAST AIP OWASP Coverage - Detailed Description for list of rules and more details. Cross-site scripting - Remove instances where a user input is ultimately displayed to the user, without any sanitization (based on a list of vetted sanitization functions, methods, procedures, stored procedures, sub-routines, etc.) of the user input value between the user input and the statement. SQL injection - Remove instances where a user input is ultimately used in a SQL statement, without any sanitization (based on a list of vetted sanitization functions, methods, procedures, stored procedures, sub-routines, etc.) of the user input value between the user input and the statement. Unsanitized user input used to access a named resource - Remove instances where a user input is ultimately used to access a resource by name, without any sanitization (based on a list of vetted sanitization functions, methods, procedures, stored procedures, sub-routines, etc.) of the user input value between the user input and the statement. Unchecked array index range - Remove instances where a user input is ultimately used in a ‘Read’ or ‘Write’ access to an array, without any range check between the user input and the array access. Improper format string neutralization - Remove instances where a user input is ultimately used in a formatting statement, without any sanitization (based on a list of vetted sanitization functions, methods, procedures, stored procedures, sub-routines, etc.) of the user input value between the user input and the statement. Unchecked return parameter from resource handling operations - Remove instances where the application uses a cryptographic list which is not part of the list of vetted cryptographic libraries. Unsanitized user input in file upload statement - Remove instances where a user input is ultimately used in a file upload statement, without any sanitization (based on a list of vetted sanitization functions, methods, procedures, stored procedures, sub-routines, etc.) of the user input value between the user input and the statement. Uninitialized data element - Remove instances where a variable, field, member, etc. is declared, then is evaluated without ever being initialized prior to the evaluation. Unchecked input in loop condition - Remove instances where a user input is ultimately used in the loop condition statement, without any range check between the user input and the loop statement. Improper locking of shared resources - Remove instances where the shared variable, field, member, etc., is accessed outside a critical section of the application. Access to released or expired resources - Remove instances where the platform resource (messaging, lock, file, stream, etc.) is deallocated using its unique resource handler which is used later within the application to try and access the resource. Unchecked range of user input to a buffer - Remove instances where a user input is ultimately used in a ‘Read’ or ‘Write’ access to a buffer, without any range check between the user input and the buffer access. Hard‐coded credentials for remote resources - Remove instances where a variable, field, member, etc., is initialized with a hard-coded literal value, and ultimately used to access a remote resource. 6.2 Establish a process to identify and assign a risk ranking to newly discovered security vulnerabilities. CAST AIP can be seamlessly integrated into the existing development process either at the build phase or before testing phase. In addition to identifying the vulnerability, CAST AIP also provides detailed guidance on how to fix the vulnerability with sample code. 6.3 Develop software applications (internal and external, and including web-based administrative access to applications) in accordance with PCI DSS (for example, secure authentication and logging), and based on industry best practices, and incorporate information security throughout the software development life cycle. 6.3.2 Review of custom code prior to release to production or customers in order to identify any potential coding vulnerability. CAST AIP out of the box includes more than 300 security best practices that cover nearly 30 programming languages. Also, CAST AIP can be integrated into the SDLC to automate the process of code analysis to identify these vulnerabilities. CAST AIP also provides additional tools like "Architecture Checker" to create custom rules unique to specific applications. 6.4 Follow change control processes and procedures for all changes to system components. CAST Discovery Portal, creates an automatic blue print of the entire system dependencies and also specifically identifies the code added, modified and deleted. This information can expedite the process of following change control procedures. 6.5 Develop applications based on secure coding guidelines and review custom application code to identify coding vulnerabilities. Follow up-to-date industry best practices to identify and manage vulnerabilities (i.e., the OWASP Guide, SANS CWE Top 25, CERT Secure Coding, etc.). The current best practices must be used for these requirements. 6.5.6 All "high" vulnerabilities identified in the vulnerability-identification process (as defined in PCI DSS Requirement 6.2). CAST AIP addresses most of these requirements. Please see CAST AIP coverage of OWASP and CWE Top 25. CAST AIP provides most comprehensive static analysis automated application vulnerability security assessment tool. CAST AIP configured to automatically run at a regular interval or after any changes to the system. All the rules and related description are referenced from OWASP. "Injection flaws, particularly SQL injection, are common in web applications. There are many types of injections: SQL, LDAP, XPath, XSLT, HTML, XML, OS command injection and many more.Injection occurs when user-supplied data is sent to an interpreter as part of a command or query. Attackers trick the interpreter into executing unintended commands via supplying specially crafted data." CAST AI Platform integrates a User Input Security Analyzer based on dataflow technology. The Dataflow User Input Security Analyzer is a technology embedded in the code analyzer that uses tainted variable analysis and tracks input data thru out the source code to find a path where the input data is sent to a target server without prior sanitization / encoding. The User Input Security Analyzer can be customized to specific need interactively to add specific sanitization, input or target methods for a given type of flaw. The Dataflow User Input Security Analyzer offer manager and developers the view of the precise path(s) where the vulnerability exist in a call path view directly in the CAST dashboards. CAST provides also 13 rules to check that Hibernate architecture & performance best practices are in place. "Cross-site scripting, better known as XSS, is in fact a subset of HTML injection. XSS is the most prevalent and pernicious web application security issue. XSS flaws occur whenever an application takes data that originated from a user and sends it to a web browser without first validating or encoding that content." Being a special form of injection, a part of the solution to get rid of the XSS threat comes from checking the protection in place for A2 Injection Flaws (see A2). Indeed, beside A2 protection (validation of all incoming data), the OWASP Top Ten document recommends the "appropriate encoding of all output data". CAST supports checking that using the same technology as for Injection Flaws: dataflow and tainted variable analysis to track input data thru out the source code in order find a path where the input data is sent back to the user without prior sanitization / encoding. The User Input Security Analyzer offers directly supports Cross-Site Scripting flaws that can be found in the technical criteria metric called "Secure Coding - Input Validation". As for A1-Injection flaws, the user can customize interactively the analysis to meet specific needs: adding specific sanitization, input or target methods for a given type of flaw is done directly thru the GUI. XSS results are displayed in the dashboard which offers the view of precise path(s) where the vulnerability exist in a call path view directly in CAST AD Dashboard. "A CSRF attack forces a logged-on victim’s browser to send a forged HTTP request, including the victim’s session cookie and any other automatically included authentication information, to a vulnerable web application. This allows the attacker to force the victim’s browser to generate requests the vulnerable application thinks are legitimate requests from the victim." Most CSRF defences can be bypassed using attacker-controlled script, so the a required step to protect against A8 is to implement a proper Cross Site Scripting protection. See the description for A3 above. Rule of a previous version of the OWASP Top 10 with no equivalent in recent versions. Kept here for reference. "Applications can unintentionally leak information about their configuration, internal workings, or violate privacy through a variety of application problems. Applications can also leak internal state via how long they take to process certain operations or via different responses to differing inputs, such as displaying the same error text with different error numbers. Web applications will often leak information about their internal state through detailed or debug error messages. Often, this information can be leveraged to launch or even automate more powerful attacks." VB: Avoid using "On error Resume Next" in the Class event terminate. Please refer to Security coverage in CAST AIP.